“St. 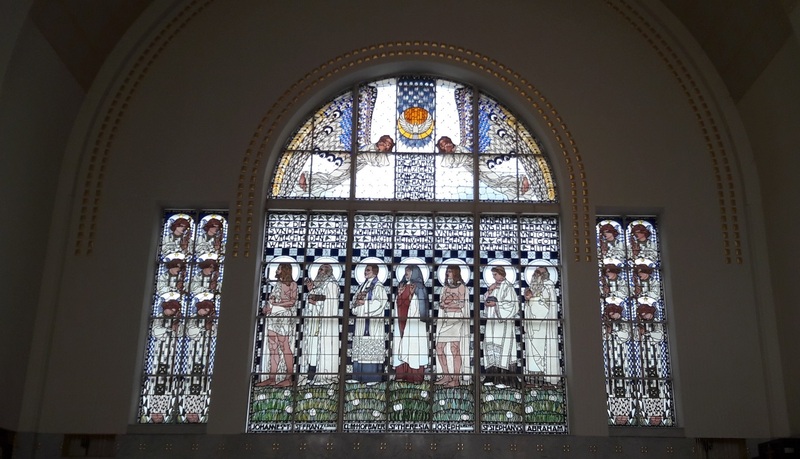 Leopold’s Church,” built by Otto Wagner, is one of the main works of Jugendstil in Vienna. Guests ask about it time and again, and since I’m a major fan of Jugendstil, I recently set about looking more closely into this insiders’ tip. 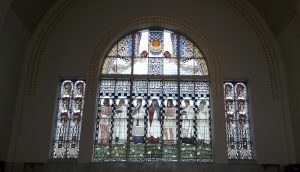 “Steinhof,” back then a modern mental institution, an “asylum,” and to this day still used as a hospital, was built on the southern foothills of the Wilhelminenberg in the then-customary “pavilion form.” Otto Wagner had drafted a design but was later commissioned with “only” the construction of the church. 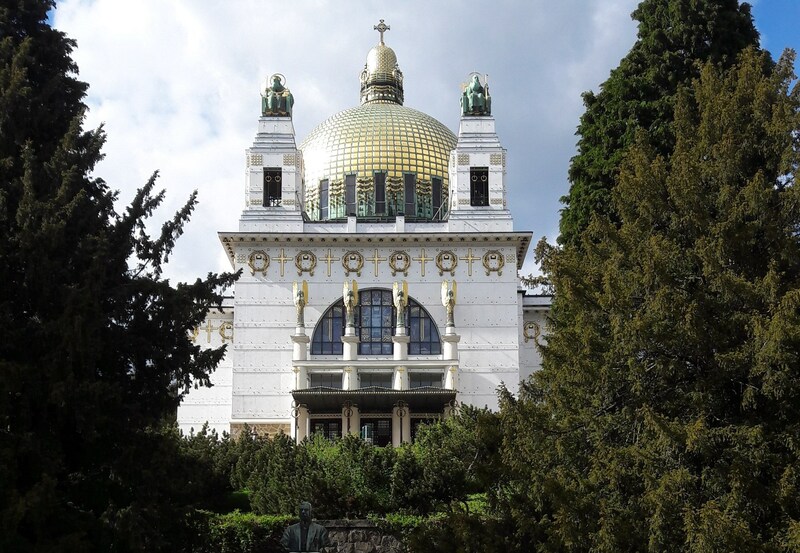 From 1904 to 1907, Otto Wagner could at long last realize his theoretical knowledge about church construction. The best-suited place for the church was found on the highest point of the hospital area. Permission was granted from the highest church circles to plan the main entrance from the south side due to the natural light. In order to offer all visitors a good view, the church, in contrast to typical church constructions, was to be a centrally planned building with lots of natural light. The high point was the special cupola, which significantly distinguishes the church’s appearance. A special stasis thereby ensues, which permits the church’s interior to appear without columns, symmetrical and bright. 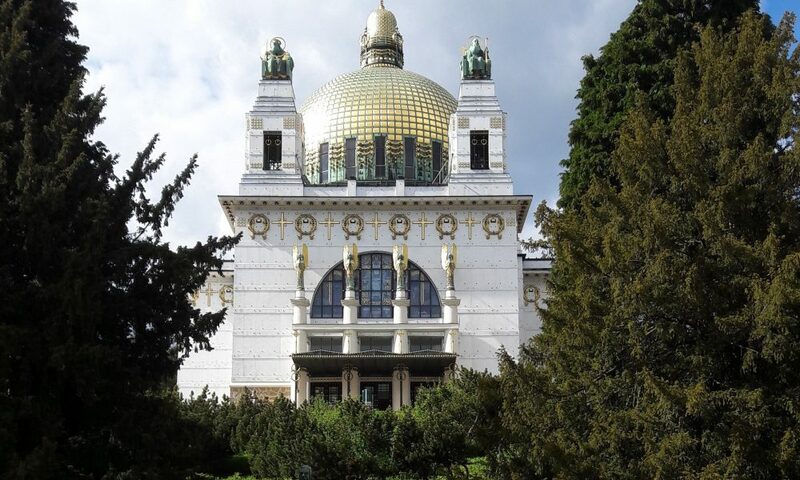 The cupola looks similar to a lime, and for this reason the hospital grounds have been named the “Lemoniberg” (“Lime Mountain”) and the church “Kirche am Lemoniberg” (“Church on Lime Mountain”) in the Viennese vernacular. From the church’s southern entrance all the way to the main altar, there is a downward-sloping floor (with a total difference of up to 26 cm). This served a hygienic purpose of making the interior of the church easier to clean; in addition, the back rows had a good view of the altar. Church benches with rounded corners, deep seats for spending time more comfortably, as well as copper coverings on the feet of the benches to help prevent tripping. The benches of different lengths are there because the patients were classified as calm, half calm or uneasy. There are short church benches with space for four people, in which the patients classified as uneasy were cared for by nursing staff to the right and left. Other rows for up to six people were available to everyone else. For security reasons, the church’s pulpit is accessible only via a staircase from the sacristy. The organ section was also not accessible to patients or unauthorized persons. There was an emergency room that always had a doctor present during church activities. 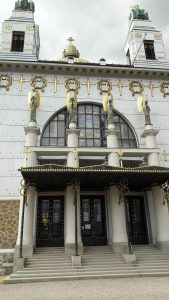 Otto Wagner even managed to have a toilet built into the church. Back then this was a revolution. Cleansing is a ritual in many religions that takes place at the beginning of service. 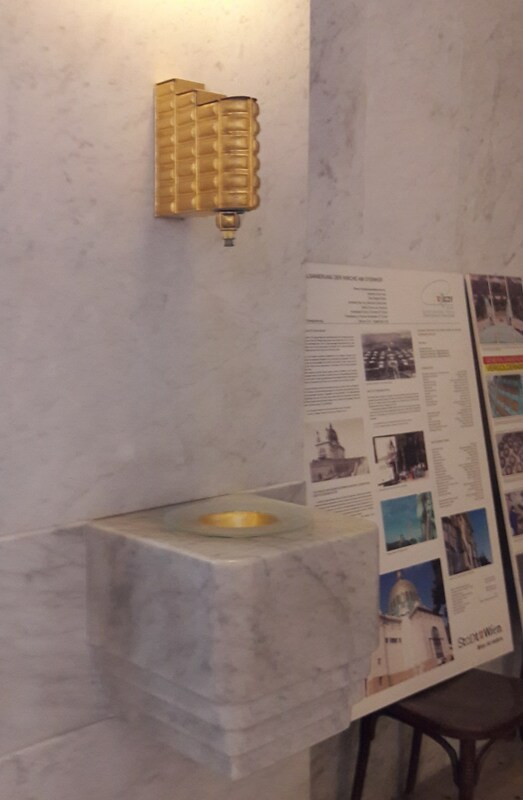 The idea behind the holy water dispensers, designed by Otto Wagner, was to fill the holy water in a hanging container, which then dripped into the bowl below. The faithful caught the falling drops with their fingers, thus avoiding any infections. From 2000 to 2006, the cupola was newly gold-plated using gold leaf and the tambour base had sheet copper newly applied. The 1800m² marble façade, as well as the figures of saints on both bell towers (St. Séverin in the east tower and St. Leopold in the west tower), as well as the angel figures, were all restored. The mosaics in the church as well as the main altar and the pulpit were also newly gold-plated. Even the church benches, confessional boxes and the sessio were renovated. In addition, all lights and wall fixtures were cleaned and newly gold-plated. You can see that a visit to the Otto Wagner Church is “worth its weight in gold.” Tours of the church are even offered; these take place Saturdays at 3:00 PM and Sundays at 4:00 PM. Advance registration is not necessary. To reach the church, start at Dr. Karl Renner Ring and take the underground line U3 towards Volkstheater. From there, transfer to the bus line 48A to the station Otto Wagner Spital. Enter the hospital grounds and head north (right of the building in front of you when you exit the bus), with a slight incline up to the church. The church is about a 10-minute walk from the bus stop. Thomas Fözö has been a receptionist at the Hotel City Central since 2015. His last name originates from the time of the Austro-Hungarian monarchy, when his great-great-great grandfather moved from the Hungarian city of Eger to the imperial capital of Vienna. As a “typical Viennese,” he has Hungarian, Bohemian, Polish and Croatian ancestors. 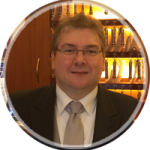 He has been in the profession passionately for over 30 years. Talking to guests, getting them enthused about Vienna, giving them an insiders’ tip or even just exchanging the occasional recipe all give him great joy. He is highly interested in the history of Vienna and is an enthusiastic fan of Jugendstil style. 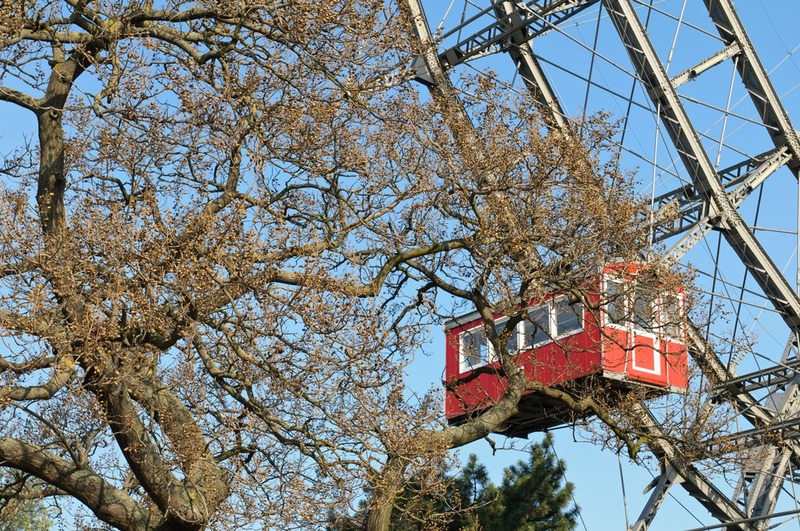 Here in the blog, he reveals his insiders’ tips throughout Vienna and he might even include a tip directly from a guest. As the Viennese saying goes, “Durch’s Reden kommen die Leut‘ z’amm” – talking brings people together – and what’s better than the reception for talking?